I got this recipe off of FB and it looked really interesting and not to hard. There were several comments on how good it is. I am wondering about cutting it in half will have to study the recipe a little more to decided on that one. Chicken and Biscuit Bake is, basically, a cross between chicken and dumplings and a pot pie. In any case, it's fabulously good and comes together in a convenient casserole! Directions: Preheat oven to 350 degrees. Warm chicken stock in a small sauce pan and add in the bouillon cubes to dissolve. Keep warm until ready to use. Lightly coat with non-stick spray a 9 x 13 casserole dish or large, round casserole dish (mine was a 12" round). Pour in the melted butter. Layer the shredded chicken on top of the butter. Sprinkle on the veggies. In a small mixing bowl, combine the milk and Bisquick. (It's okay if there are a few lumps remaining.) Pour over the chicken and vegetables. DO NOT MIX! Sprinkle on a little black pepper, if desired. Combine the cream of chicken soup with the warmed stock in a small mixing bowl. Once blended, slowly pour over the Bisquick layer. Again, DO NOT MIX! (Yes, it'll looks like a big, soupy mess. Trust me ... this is what it's supposed to look like!) 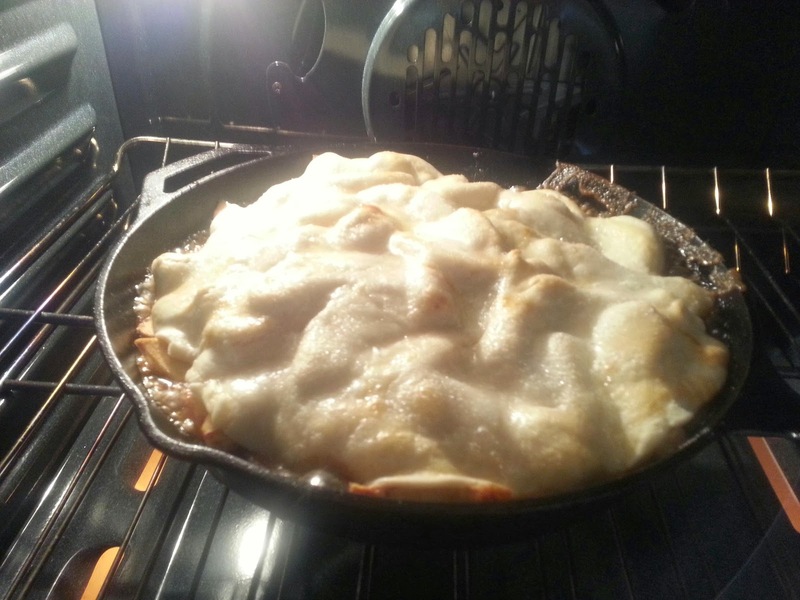 If using a 9 x 13 pan, bake for 40 - 45 minutes or until casserole is set and top is brown and bubbly. If using a large, round dish (mine was 12"), bake for 50 - 55 minutes or until casserole is set and top is brown and bubbly. Remove from oven and allow to rest for 5 minutes. Serve and enjoy! Peel apples and cut into ½-inch-thick wedges. Toss apples with cinnamon and ¾ cup granulated sugar. Melt butter in a 10-inch cast-iron skillet over medium heat; add brown sugar and cook, stirring constantly, 1 to 2 minutes or until sugar is dissolved. Remove from heat and place 1 piecrust in skillet over brown sugar mixture. Spoon apple mixture over piecrust and top with remaining piecrust. Brush top of piecrust with egg white; sprinkle with remaining 2 tablespoons sugar. Cut 4 or 5 slits in top for steam to escape. Bake in preheated oven 1 hour to 1 hour and 10 minutes or until golden brown and bubbly, shielding with aluminum foil during last 10 minutes to prevent excessive browning, if necessary. Cool on a wire rack 30 minutes before serving. Serve with vanilla ice cream and whipped cream.